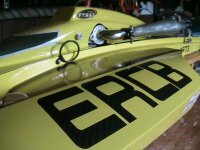 CC Racing Engines have been making top quality R/C boat engines since the mid 90's. Over the years the engines they produced have consistently gotten better and faster. Up until recently, Carlo Catalanotto, owner of CC Racing Engines had always done the porting by hand on each and every one of the motors coming out of his shop. These days, taking advantage of the advances in technology, CC Racing Engines have developped an almost fully CNC (Computer Numerically Controlled) ported Zenoah engine. All the cylinder porting as well as the modifications done to the piston are now done on CNC equipment that yield a near perfect finish to all cylinders and pistons and ensure perfect symmetricalness from one side of the piston/cylinder to the other. Note I said "near perfect finish"...the reason I said this is that Carlo still does a bit of his magic manually even on the CNC machined parts. In some instances a machine simply cannot do what the hands of a tallented engine builder can! Back in 2004, a CC Racing hand ported motor was used in the boat Jeff Michaud of Insane Boats used to set the NAMBA world speed record for G1 Hydro and to become the first gas boat to go over 100mph! Since then CC Racing Engines have been in the winner's circle of countless races and set many more records. Their track record truly speaks for itself. Recently with the new CNC version engines, the CC Racing / Grim racing team have had boats in excess of 108.8 mph and they are still raising the bar! See the CC Racing Engines website for more info on records set. I have been running two of these new full mod Zenoah 260 CNC engines from CC Racing this season and can say that they are real powerhouses. The first time I started up these motors I knew right away they were different. The throttle response was incredible and crisp and the motor produced a lot of torque. I tested the motor with the CC Racing steel tuned pipes as well as their Powermaster aluminum pipe, both of which use 1" headers. The performance was nothing short of excellent. In addition to this, each new lower end assembly is taken apart and checked for accuracy of parts. The crankshafts are verified for trueness and if they are not within CC Racing tolerences, they are replaced. The low drag seals are installed with a special tool to ensure they are properly in place and true with the crank. Any slight misalignment of these seals can cause air leaks and subsequent headaches for the end user! I have had the opportunity to visit the CC Racing Engines workshop and have witnessed Carlo assembling and working on engines, and I can assure you that everything is done with care and attention to details and accuracy. Here are a few pictures of the motor. You can clearly see the fine work to the carburetor throat and bell as well as to the intake port. Notice the perfect matching of the carburetor isolator block to the engines intake port. The inside work is equally as impressive. Note the smooth finish on all ports, including the transfer ports and the eyebrowes. The last picture is of the exhaust port as it comes off the CNC. You can still see the small machining traces. All other ports have been retoucched by hand to a beautiful, clean flowing finish. You will notice that the engine is numbered on the bottom by CC Racing. If you are buying the engine used or from a source other than CC Racing Engines directly, you can use this serial number to check the history/authenticity of the engine with CC Racing. If buying used, I would recommend having the engine inspected and possibly refreshed by CC Racing to ensure you are getting the most out of your engine and all the latest mods. "Since we have started building the engines with CC Racing designed CNC porting, not only have we picked up hosepower and torque across the board, but the consistency from engine to engine has simply been amazing. We have actually dynoed three new modified engines back to back then overlayed the dyno graphs and could not even tell we switched engines. The days of one engine being better than another one with the same mods are gone. All of the engines are now as good as they get and are simply consistent because of the ports being symetrical from side to side, something that is just impossible to do by hand. Our customers have set over 12 world records in the short time since the new style engines have been released. They hold the distinction of being the first NAMBA G1 and IMPBA LS27 engines over 100mph, the first gas engine to ever break the 10 second lap barrier and the destinction of the fastest pass ever of 108.8mph. 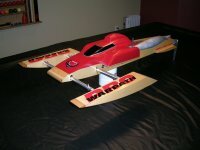 Over the years, CC Racing Engines have become a very familiar name in the R/C boat world. They are also setting records in the R/C buggy world. Because of the great track record and excellent customer service, pre and post-sale, they are in very strong demand. Depending on the time of year the turn-around time on an engine can be 2-3 weeks so keep that in mind and do not wait to the last minute to get yours...contact CC Racing Engines now! You can now easily order on their online store. See contact information below. A good Mod Zen will be in the 6.0 - 6.3 hp range and on water RPM will be in the 17000-19000 depending on prop and boat. This engine is up there. Anyone claiming much higher than that for a mod Zenoah is probably full of it or has a dyno that's saying what they want it to say. I've seen a lot of different mod Zens, and take my honest word for it, not many are in the 6hp + range. Those are some huge eyebrows! Looks like a fine engine. But i see no information about weight and performance in hp or rpm in standard version. Can anyone help me out about these items?